My friend Mary was sweet enough to give me a basketful of campari tomatoes again. I was so excited, I have been waiting for the right tomatoes to make this dish and I finally had them. Well, I know what you are thinking... Feta, surely Chad and Munchkin didn't eat that. No, you are right. Neither of them would touch it. But, I didn't say I made it for them. My friends came over to play games Saturday night, the same ones I shared the Creamy Peanut Butter Pie for Mikey with. My friend YaYa came over (Munchkin calls her YaYa not sure how she came up with that, but I later found out it means Grandma in Greek - so it fits, she is like family. And it stuck.) she really enjoys Italian flavors too, and she was thrilled to share this salad with me. I also brought it to a barbeque that we went to on Sunday. Mary hosted. I told her about the pasta salad on the phone and warned her to eat around the feta, but she apparently forgot. She was sweet enough not to spit it out though. Although I wish I had my camera to capture the look on her face when she realized it was feta and not mozzarella. I am still enjoying the pasta salad. 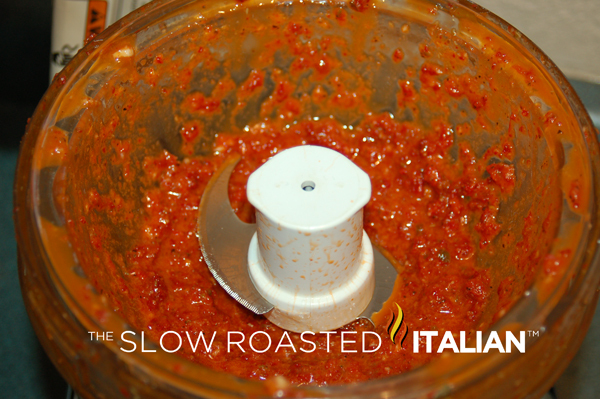 The tomato flavor is amazing, the sweetness of the tomato and the tang of the vinegar. It all comes together perfectly. It seems to get better each time I go back to eat it. Yes, this dish is a stand in the fridge with a fork kind of hazard. 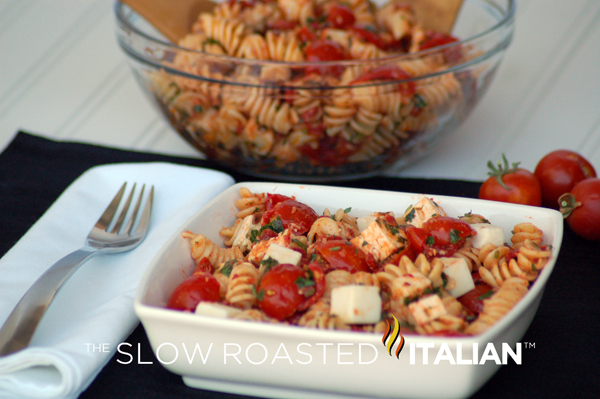 This is a quick and easy summery dish! Buon Appetito! Cook the pasta in a large pot of boiling salted water. Boil for 12 minutes, or according to the directions on the package. Drain well and allow to cool. 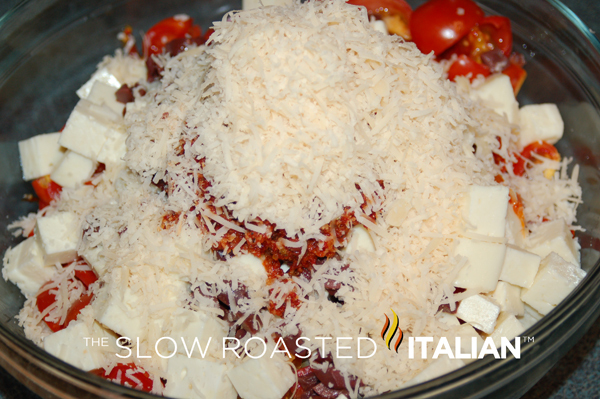 Place the pasta in a bowl and add the tomatoes, olives, feta and chopped sun-dried tomatoes. Serve immediately or cover with plastic wrap, refrigerate and serve later. Yes, this was delicious, but darn that feta! Looks delicious and am eager to try it with the Feta. I just love Ina's recipes. Always such clean, developed flavors. This dressing looks killer. Also love the cubed feta. Looks so pretty in there. Now if they'd only make goat feta that could be cut up like that, I'd be in heaven. Ha ha ha I love feta ten times more than mozzarella! Your salad sounds so good!! I love Ina's recipes! Haha! I loved the fact that the cook made what the cook loves! We have a rule in our grey cottage ... don't second guess the cook. She makes the food decisions - so be kind when criticizing. 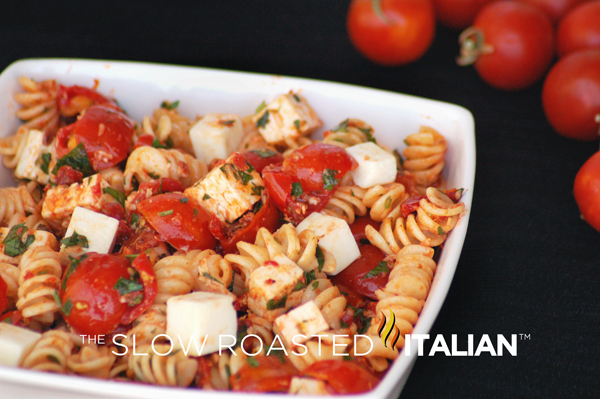 Your pasta tomatoes and feta look positively delish! God bless Ina, huh? I could eat this kind of food every day - nice recipe! Oh, I'd have to eat this whole salad by myself, too, but I'd be willing It looks fabulous...and lucky you with the gifted tomatoes...mmmmmm. Wow your pasta alone sounds awesome, but with that decadent topping? Delicious! 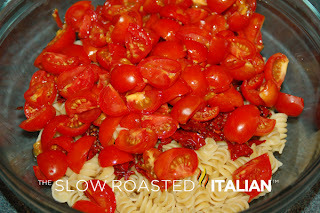 Such a simple and a great way to enjoy some tomatoes! This salad looks wonderful. I love the vibrant colors and the flavors sound perfect! that's a delighting pasta! i prefer parmesan or mozarella over feta but feta isnt that bad..just a little cheesy and salty for me.Tomatoes, we all just love them!! This recipe is awesome! It is simple to make, light, and the taste, well, awesome! I was looking for a good recipe that included pasta lately, but couldn't find anything and just as I was about to give up, I found your site! Lucky me! !